The CS:GO Graffiti Box was released on October 6th, 2016. This offers players the ability to spray graffiti on certain locations within the game. 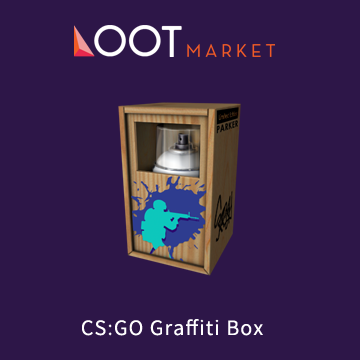 There are two types of graffiti boxes available: a CS:GO Graffiti Box and a Community Graffiti Box 1. The former is supplied by Valve. The latter has artwork from community artists. Proceeds from the sales of community graffiti boxes are shared with those artists. One for Free – For a limited time, you will get one just by launching the game. Drops – There’s a chance you will get a graffiti box as a free weekly drop for ranking up. Buy on Steam – You can buy individual graffiti patterns from the Steam market. Monochrome – Just one color. These are what you will receive as a drop when you rank up. Multi-colored – You will not receive these for free. You must buy these from the Steam market. Each graffiti can comes with 50 uses. If you use up 30 and buy another can, it will add a fresh 50 on top, giving you 80 sprays. How Often Can I Spray Graffiti? You can spray once per round or every 45 seconds, whichever is shorter. How Long Does Graffiti Last? It lasts 7 minutes, degrading over time until it is no longer visible. Where Can CSGO Graffiti Be Sprayed? Walls, corpses, boxes, damn near anywhere. But there are some surfaces where it cannot be sprayed. If it can be sprayed, the graffiti preview will work. If it cannot be applied there, then you will not see a preview.